Browse to your Google Tag Manager container, and open the Google Analytics tag or Google Analytics Settings variable you want to modify. Make sure the tag or variable is in edit mode, meaning you can see each field as a text field that you can edit. Save the tag or variable. 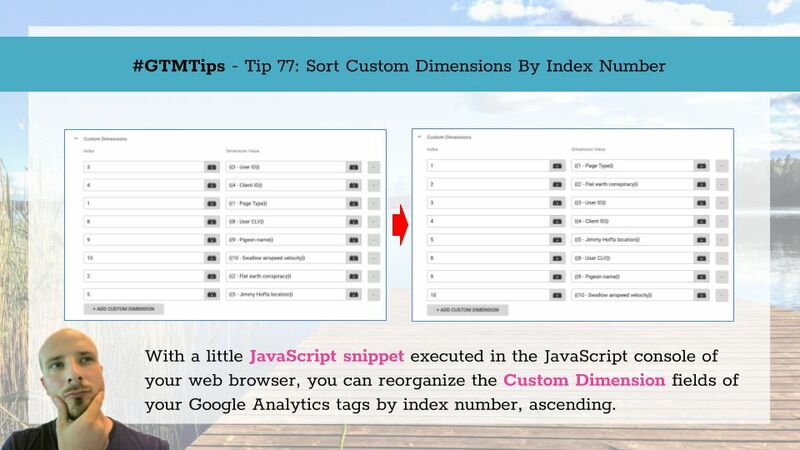 The snippet basically rewrites each field in the list of Custom Dimensions so that the rows are in ascending order, sorted by index number of each Custom Dimension. If the snippet stops working, please let me know in the comments below and I will update it. Naturally, I am anxiously waiting for sorting of fields to be a built-in feature of the Google Tag Manager UI. But until then, we can hack our way around this limitation.